There is a narrative; A Nereid nymph rides side-saddle on the back of a fish-tailed horse or Hippocampus, and Neptune is leading them. The lines are implied. There are negative spaces and a variety of colours. The artwork is two-dimensional, but the shadows give the sense of depth. 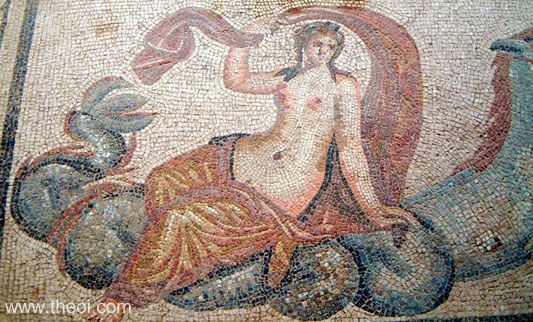 There is lots of texture in the mosaic itself, a mosaic pattern. There is the same amount of positive and negative spaces. The different tiles give the illusion of light and dark and there are some tonal contrasts. The colour scheme is earthy colours and the tiles are coloured. There is much visual rhythm and repetition, especially at the bottom. The artwork is balanced, symmetrical and quite harmonious. The medium is tiles and they play a very important role in the artwork. The artworks evokes curiosity and a heroic feeling. The artwork is held in Ephesus Archaeological Museum in Seljuk, Turkey. It is made of floor mosaic. The date it was made is around C3rd AD in the Imperial Roman Period. The purpose it served was to be a floor mosaic. The size is unknown.